Combine rice, broth and water in medium saucepan; bring to a boil, stirring occasionally. Reduce heat to medium-low, cover and cook 15 minutes. Remove from heat and let stand 5 minutes. Heat a 4 to 5 quart pan over medium-high heat for 3 minutes. Add sausage and onion; cook, stirring occasionally 3 to 4 minutes or until onion is tender and sausage is lightly browned. Add mushrooms, garlic and oregano; cook 2 minutes, stirring occasionally. Reduce heat to medium-low; stir in lemon juice. 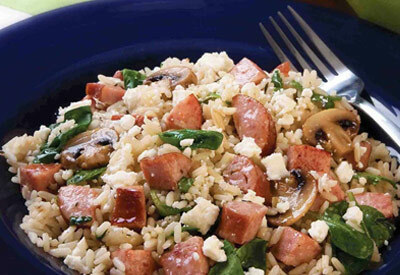 Gently fold in cooked rice, spinach, feta cheese and pepper. Toss lightly for 1 to 2 minutes or until spinach is wilted.